A fire is likely one of the scariest and most devastating factors that may happen to your property. Every year, houses and business structures catch fires in the states of New Jersey and New York for a number of reasons. The lucky ones suffer from partial property damage. In more extreme cases, hundreds of thousands of dollars go up in smoke and human lives are lost. As dangerous as a fire are while it rages on, it can be equally damaging to your property and the health of your family members long after the last embers have been put out. The smoke that’s produced in massive plumes during the course of the fire spreads soot and caustic substances on every surface it touches. Over time, these chemicals and particles not only emit a burnt odor that doesn’t go away, they also react chemically with wood and metals. These chemical reactions cause a wide array of further damage to property that your insurance policy might or might not cover. To get smoke odor removal and all its traces out of your home or business for good, you’ll need help from a professional fire damage restoration company. AllStates Restoration is exactly that type of service provider and we have been doing it for many years. We have the knowledge, experience and equipment to provide quick and effective smoke and soot odor removal from upholstered furnishings, carpets, draperies and building interiors in your NJ, NY, PA and CT residence or place of business. Our team will clean, deodorize, refinish and restore hard furnishings; such as desks, tables and credenzas. 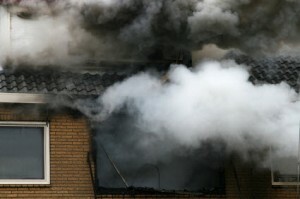 Our experience includes residential commercial and industrial smoke damage restoration. If not charred; carpet, furniture, draperies and other building contents can be restored to their pre-loss condition. First we identify the source of the odor. Then we remove the odor. After the odor causing particles have been removed, we also clean and disinfect all affected surfaces. Smoke and protein odor removal. State of the art cleaning equipment. What Smoke Damage Sets at Risk after a Fire? Woodwork – The caustic chemicals in smoke can eat away at wood, causing it to discolor, peel or chip over long stretches of time. Metalwork – Caustic substances often trigger corrosion on metals, making them rust much quicker than they should. Smoke’s caustic particles become particularly potent when moistened. Electronics – Gadgets and appliances have circuit boards which are particularly sensitive to acidic and corrosive substances. If smoke & soot gets inside your TVs, computers and stereo systems, you will be looking at hardware failure as time passed. Artwork – Painted art is especially susceptible to smoke damage because canvas and paint tends to be afflicted by discoloration when smoke and soot react with them chemically. Human health – Respiratory issues, skin irritations and hypersensitive reactions are common reactions to prolonged smoke residue exposure. To people who experienced dangerous fires up close, the smell of smoke can cause extended emotional and psychological stress. To make sure that fire doesn’t do more damage than it already has, give Allstates Restoration a call today. We’ll schedule a free inspection and cost estimation right at your New York, New Jersey, Western PA and Southern CT property. To schedule smoke odor removal appointment, call 888.651.2532 or click here.